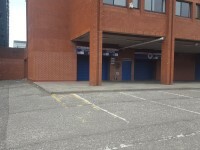 You are on Outside Access (Bill Struth Main Stand Hospitality Entrance). Skip to the next section. 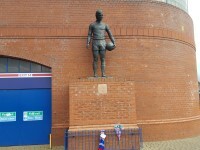 This information is for the entrance located at the centre of the Bill Struth Main Stand, on Edmiston Drive. 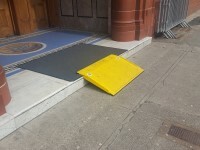 Please contact a member of staff for use of the portable ramp. 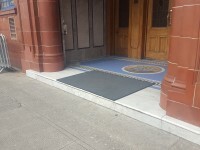 There are two portable ramps available at this entrance. 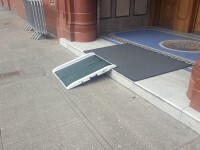 The widths of the portable ramps are 75cm and 100cm. 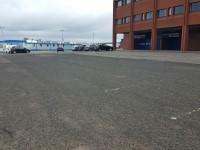 You are on Access Point (Gate 19 - Alternative Entrance). Skip to the next section. 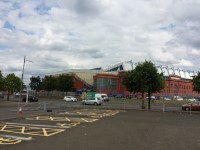 This information is for the access point located at the front of the Bill Struth Main Stand, on Edmiston Drive. The access point is clearly signed. 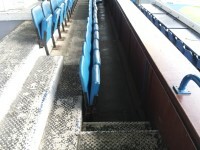 There is step-free access to the access point. 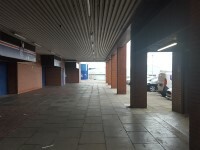 The access point door(s) does/do contrast visually with its immediate surroundings. The width of the access point opening is 160cm. 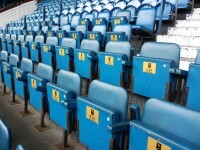 There is a steward available for assistance. 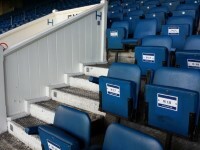 Access Gate 19 is used on a matchday to access the lift for the Bill Struth Main Stand Front Tier Concourse, Bill Struth Main Stand Rear Tier Concourse, Bill Struth Main Stand Hospitality and the Bill Struth Main Stand Club Deck Hospitality. 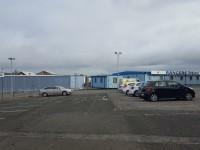 There is a member of staff available to provide assistance. 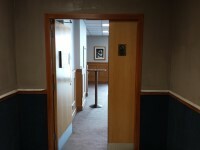 The route from the entrance to the lift is via an area for staff, players and officials. 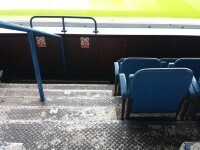 Supporters who need to use the lift will be given a pass to access this area. 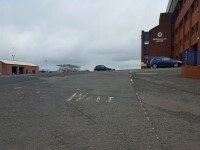 The reception point is located ahead as you enter. 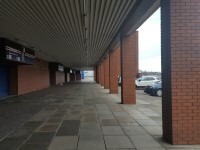 There are no windows, TVs, glazed screens or mirrors behind the reception point which could adversely affect the ability of someone to lip read. 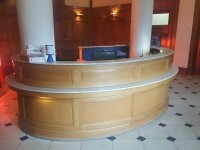 The height of the reception counter is medium height (77cm - 109cm). 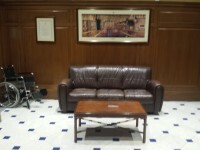 There is a hearing assistance system at the reception point. 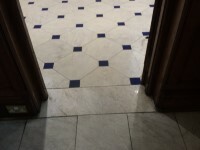 The type of flooring in the reception area is tiles. 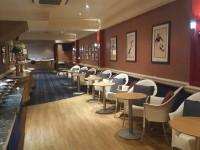 There is bench seating and also a mixture of single seats with and without armrests. 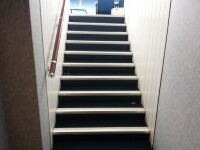 The height of the step(s) is/are not between the recommended 15cm and 18cm. 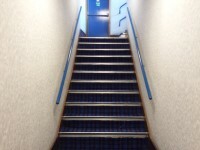 Clear signs indicating the facilities on each floor are not provided on landings. 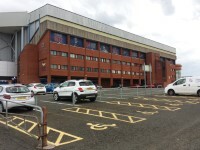 The lift is located in the staff area, to the right as you enter Access Gate 19 or to the left as you enter the Bill Struth Main Stand Hospitality Entrance. 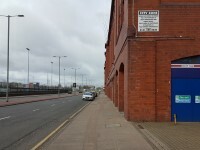 Signs indicating the location of the lift are not available from the entrance. 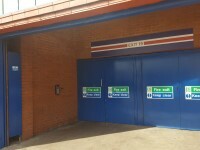 A member of staff is required to operate the lift. The colour contrast between the external lift controls and the control plate is poor. 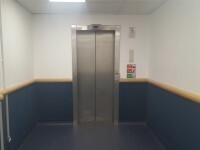 The colour contrast between the external lift control plate and the wall is poor. 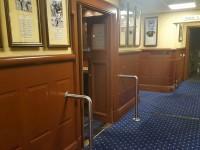 There are no separate entry and exit doors in the lift. You are on Getting Around (First Floor). Skip to the next section. 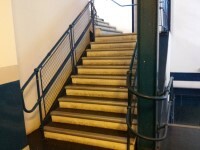 There is step-free access throughout the first floor. 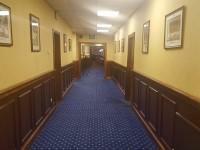 The type of flooring in corridors/walkways is carpet and tiles. 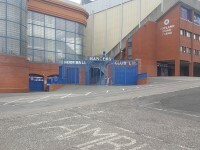 The portable loop is located at the Bill Struth Stand main reception. 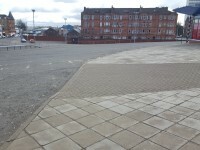 Please contact a member of staff if you need to use the loop. 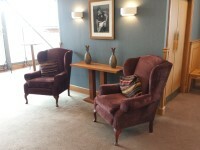 You are on Hospitality (Thornton Suite). Skip to the next section. 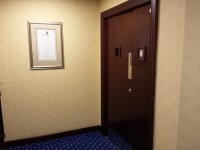 The suite is located to the right after you exit the lift at the rear of the lift. 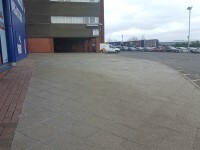 There is step-free access to this area. 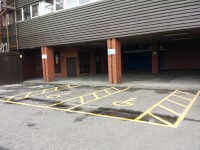 There is a/are double, light manual door(s) to access this area. The door/opening width(s) is/are 75cm+ for the room(s). 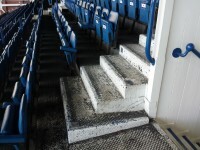 There is step-free access within this area. 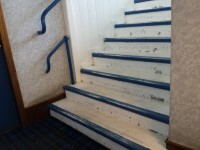 There is some flooring which includes patterns or colours which could be confusing or look like steps or holes to some people. 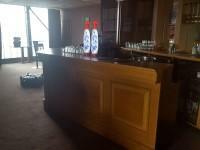 There is a bar/service counter. 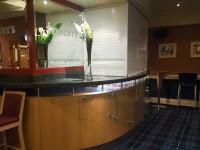 The height of the bar or service counter is high (110cm+). 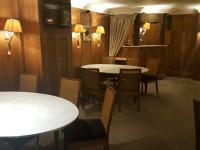 The clear floor space beneath tables in the room(s) is 70cm. 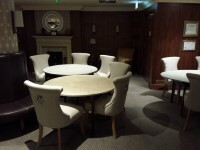 No chairs have armrests on both sides. Background music varies according to the function/event. The type of service provided in this room can vary. 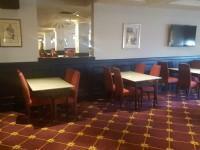 The layout of the room varies according to what it is being used for. 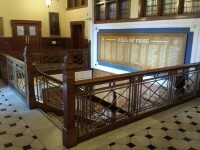 The access to the seating along the first floor corridor. 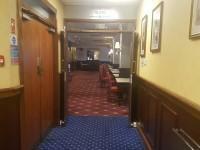 There is a single width door, which opens away from you and is 85cm wide. 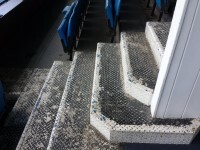 There are 15 plus steps with handrails on both sides leading up to the seating. 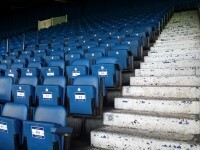 Once into the stand there are 1 to 10 steps leading to the seating. 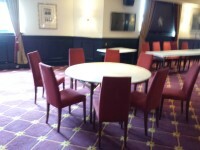 The Thornton Suite seating is located in rows L to P.
The room can be hired for functions and meetings on non match days. 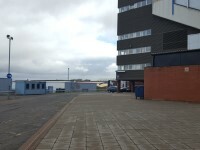 There is not an/are not accessible toilet(s) available within the room/suite. 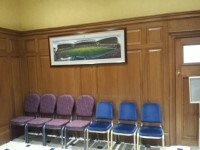 There are standard toilets available within the room/suite. 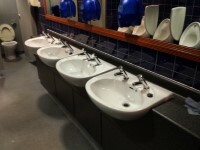 There are not ambulant cubicles available in the standard toilets. There is not a separate parent and baby room within the room/suite. 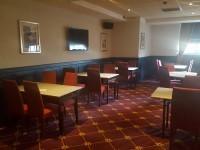 You are on Hospitality (Members Room). Skip to the next section. 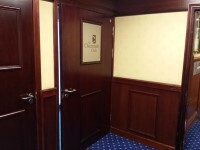 The room is located to the right after you exit the lift. 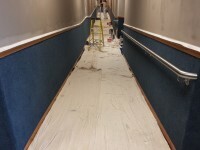 The type of flooring in this area is carpet and vinyl/laminate. 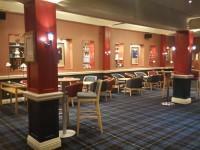 There is some flooring which is shiny and could cause issues with glare or look slippery to some people. 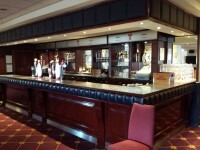 The height of the bar or service counter is medium height (77cm - 109cm). 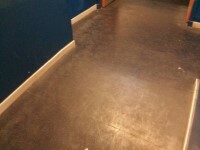 The clear floor space beneath tables in the room(s) ranges between 57cm and 120cm. 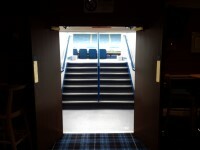 The access to the Members Room seating is via double width door, the door opens towards you and is 130cm. 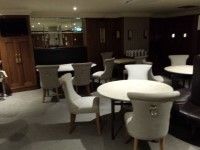 There are 7 steps from the Members Room to the hospitality seating. 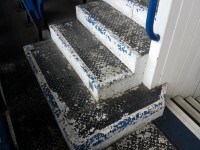 The steps are medium height with handrails on both sides. 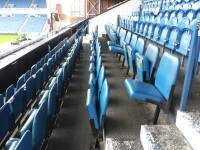 Once into the stand there are 1 to 15 plus leading to the Members Room seating. 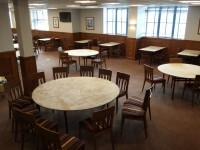 The Members Room seating is located on Rows A to L.
There are not standard toilets available within the room/suite. 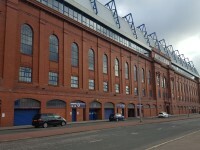 You are on Hospitality (Chairman's Club). Skip to the next section. 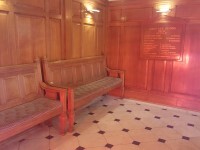 The room is located to the right after you exit the lift, along the first floor corridor. 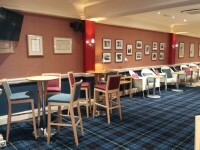 The Chairman's Club hospitality seating is located along the first floor corridor. 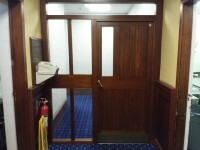 There is single width door, the door opens towards you and is 105cm wide. 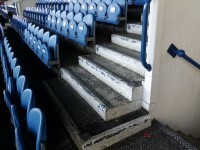 After the door there are 10 clearly marked steps with a handrail on the left, leading from the corridor out to the seating area. 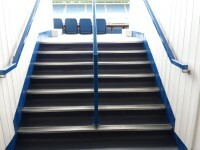 Once in the stand there are 1 to 8 steps leading to the Chairman's Club seating. 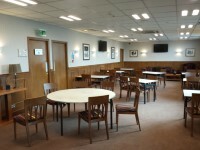 The Chairman's Club Seating is located on Rows A to E.
You are on Hospitality (Coopers Suite). Skip to the next section. 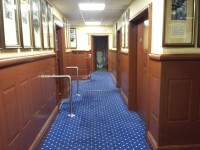 The suite is located on the first floor to the right of the Club Deck lift or along the corridor from the main lift. 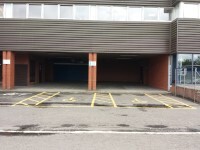 There is a/are single, light manual door(s) to access this area. 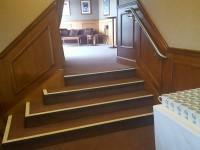 There is step free access to the bar area. 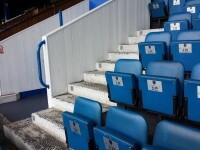 There are 4 steps to the majority of tables. 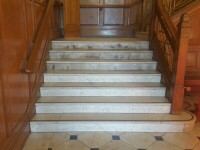 The steps are medium height with a handrail on the left going down. 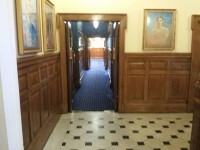 There is another similar entrance further along the corridor which gives access to the seating area. 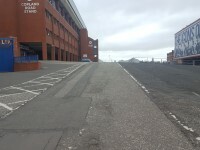 There is a slight slope leading to this entrance. 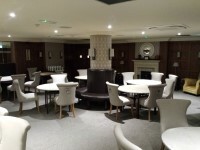 The clear floor space beneath tables in the room(s) ranges between 70cm and 100cm. 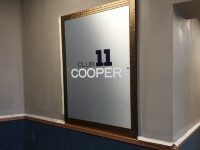 The access to the Cooper Suite stand seating is located to the rear of the suite. 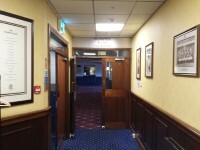 There are two sets of doors leading from the suite. 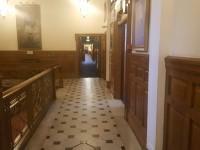 There is a single door, which opens away from you and the door is 80cm wide. 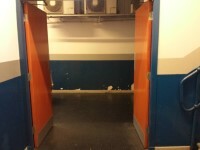 Just beyond the single doors there is a double door, which opens away from you and is 160cm. 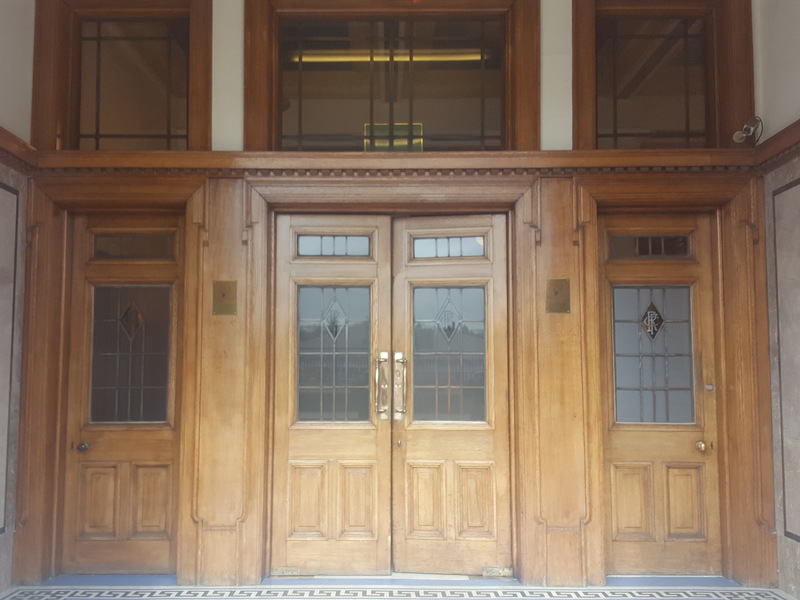 There is a slight slope located in the second set of doors. 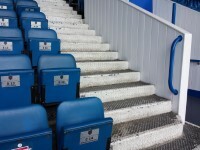 There are 15 plus clearly marked steps leading up to the seating area. 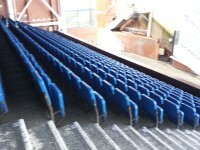 Once out into the stands there are 1 to 15 plus to access the rows of seats. 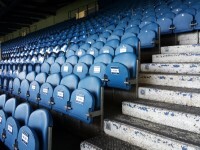 The Cooper Suites seats are located in Rows L to Q. 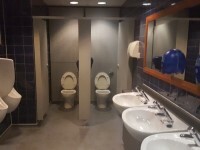 This accessible toilet is located to the right as you exit the lift. 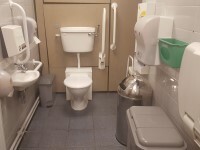 The dimensions of the accessible toilet are 140cm x 300cm (4ft 7in x 9ft 10in). 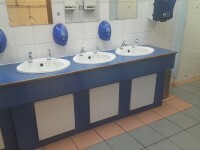 The height of the soap dispenser is 65cm. The contrast between the wall-mounted grab rail(s) to the left of the toilet and wall is poor. 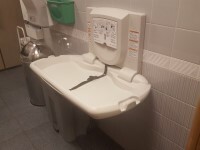 The contrast between the wall-mounted grab rail(s) to the right of the toilet and wall is good. 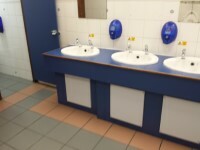 The female and male toilet facilities that were surveyed are located along the corridor. 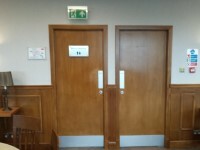 There is step-free access to the female and male toilet(s), via lift.